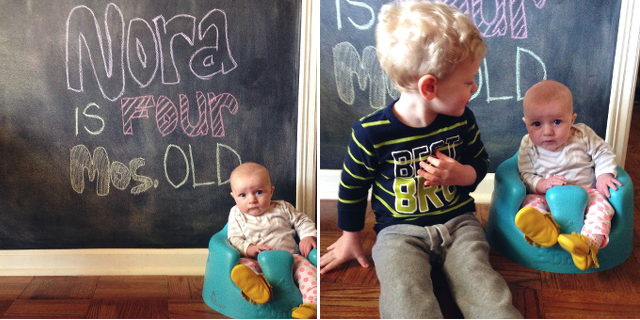 Chasing Davies: Baby Nora: 4 month update + a video! 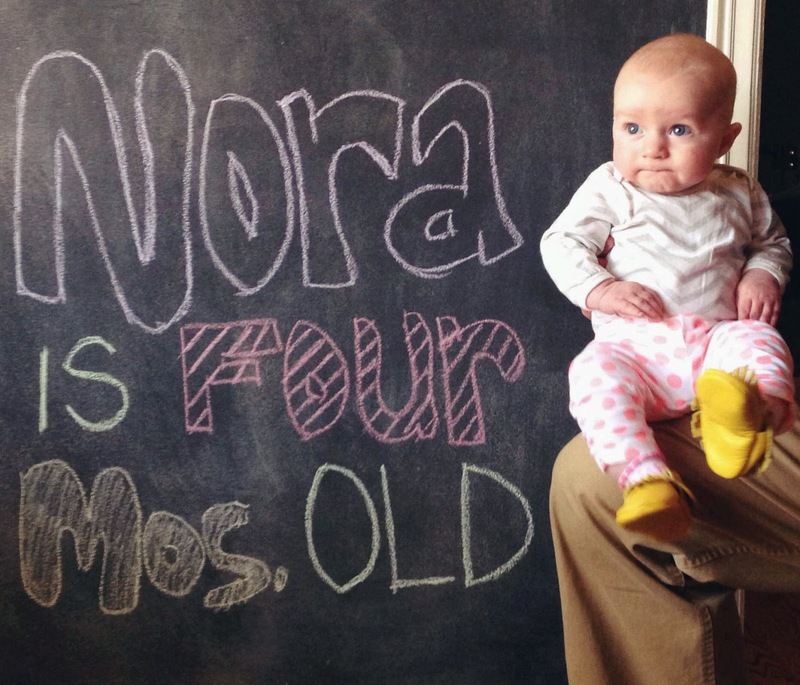 Baby Nora: 4 month update + a video! It was the best of times... it was the worst of times. This kind of rings true for this past month, as there were SO many ups and downs. Though, every day with my growing little girl is a great day, no matter how hard they can be, because man, they go fast. Here's a run down of this past month! Stats: We'll find out later today, but about 10 days ago when she was sick she weighed 12 lbs 12 oz. She just started wearing 3-6 month clothes, mainly because of length. So I've been slowing packing away all her newborn and 0-3 month pieces (sniff, sniff). 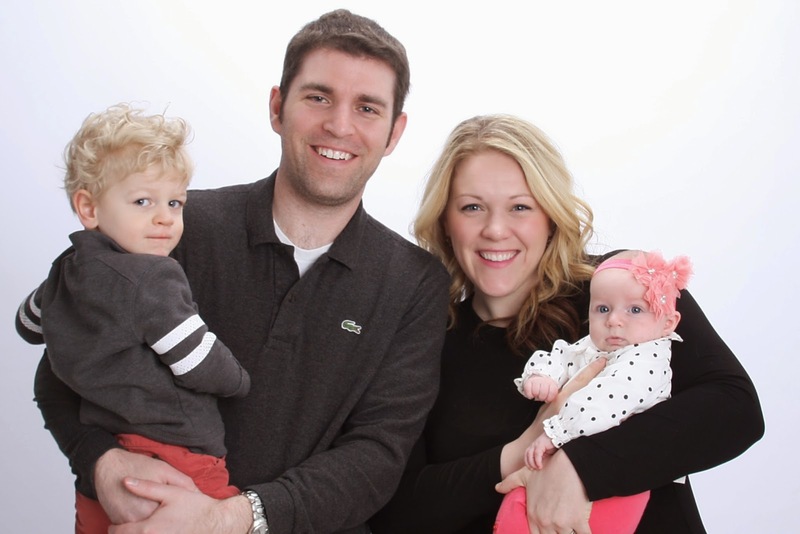 Sickness: Baby Nora had struggled for weeks with stuffy nose and congested, and then one day it just got worse! So I took her into the doctor and sure enough... her first ear infection, at a pretty early age, but because she was over 3 months, we were able to treat it with antibiotics and pretty much ran the humidifier for about a month. She just finished her meds and seems to be almost clear! We'll double check at her 4 month well visit today! Sleep: For about 3 of the 4 weeks of this past month, Nora had a really hard time at night (worse than ever). Maybe it's because she was also sick, or maybe a growth spurt? She was up every 1-3 hours every night, all night. And most nights, there was a chunk of 3 or 4 hours when she would only sleep in my arms. With having gone back to work just a month ago, I was getting the least amount of sleep I've ever gotten (even with Liam). I was somehow managing to get by on only 3-4 broken up hours of sleep and after a couple weeks, I literally felt like my brain was melting. 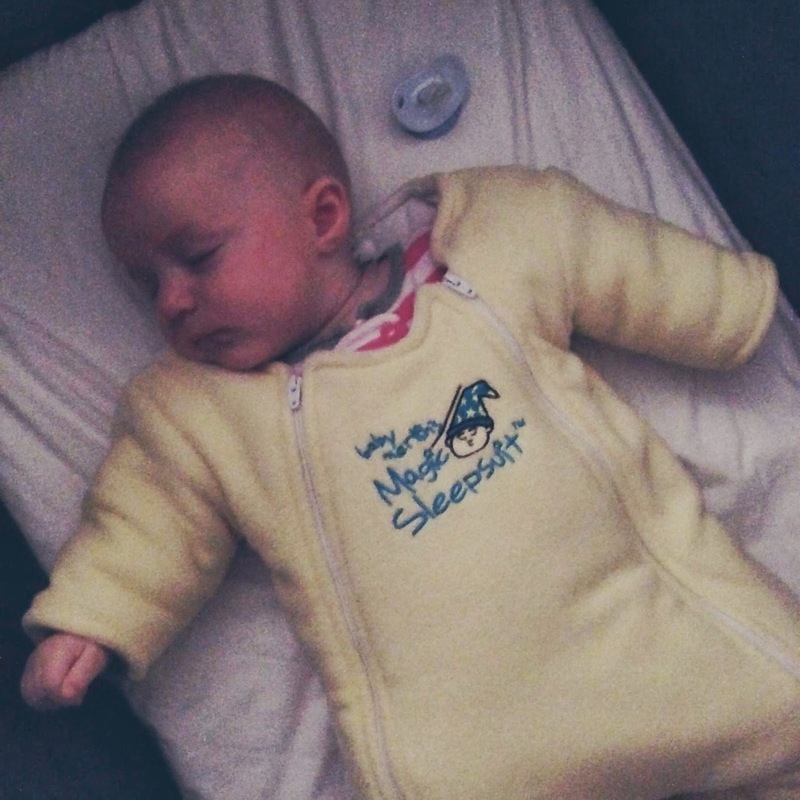 So, just when I really couldn't take it anymore, we plopped miss Nora in the baby Merlin Magic Sleepsuit (shown above), that came recommended to us by my husband's cousin (as I had never heard of it before, but she swore by it for her babe!) AND SHE SLEPT NINE HOURS STRAIGHT IN HER CRIB!!!! And then she did that for the next 3 nights! And on the 4th night, she only woke up once to eat and went right back to sleep. And that brings us to tonight, which will probably be awful (because the minute you talk about your baby sleeping...), but at least my brain has healed some. We had been swaddling her before, as mentioned in her one week recap, which worked well from about 0-3 months, but I think she just outgrew it (she did in size, but also I think in her need). This Merlin Suit is a great swaddle transition that still provides comfort and absorbs their natural reflexes that wake them up, but allows them to move some, like for Nora, put her arms slightly above her head. It also keeps her warm and feeling snug, all while safe for sleep. One of our biggest problems wasn't that she was not sleeping, but wouldn't sleep out of our arms for long or at all - I'm not sure if she just got tired enough (hah!) or it's this suit, but I'm putting her in it every night until she's 20 (ok, only comes in 2 sizes). 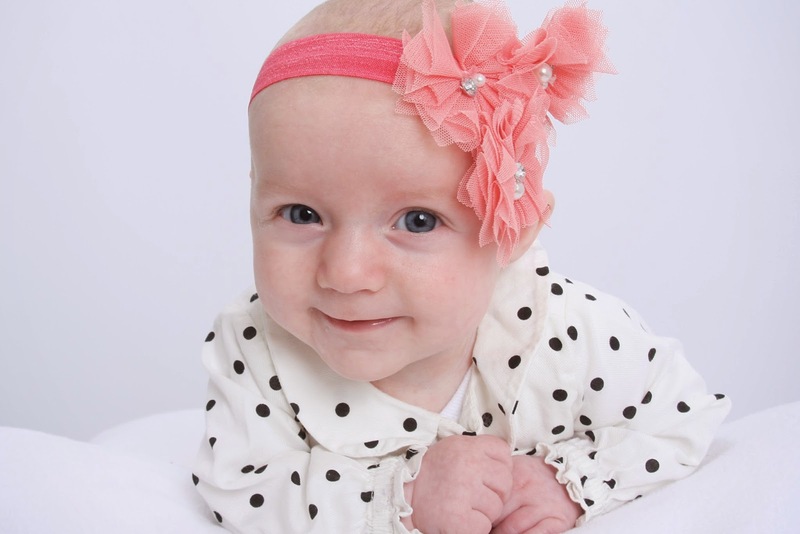 ^^We got a few quick studio photos taken of her and one family shot. I look forward to getting outdoor photos of her, Liam and the family this summer, but was happy with how these turned out. She is growing so fast that I just want to capture her at every stage. The above pics were at about 3.5 months. ^^She loves to sit up! 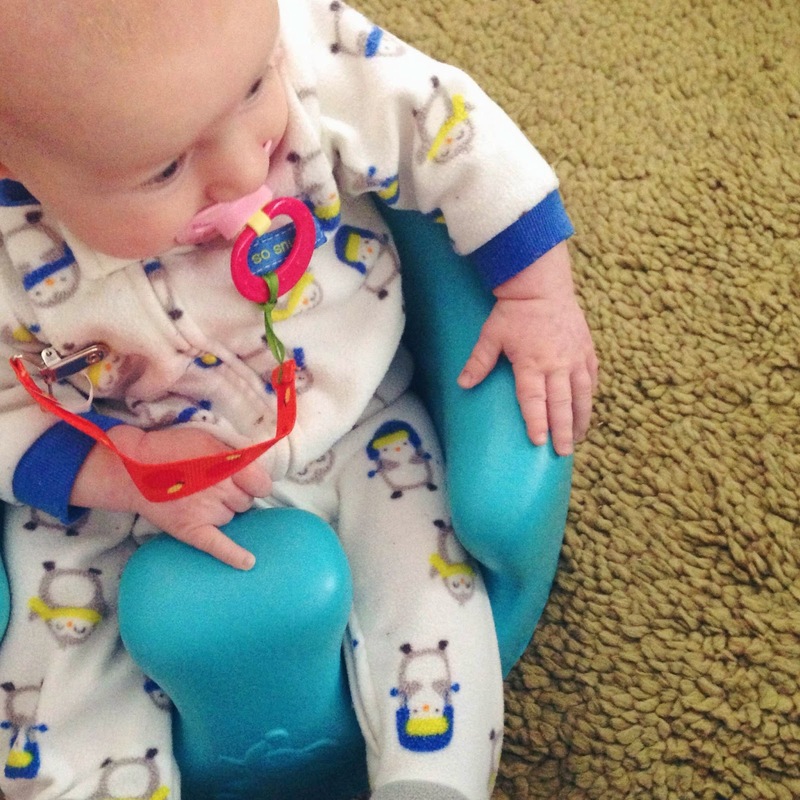 The Bumbo is perfect for that. Big brother Liam is still great with his baby sister Nora. He is a big help when it comes to entertaining her with silly faces and sharing the iPad with Curious George playing. I can't wait until the day they can interact more and actually play together, but as she's beginning to play more at her own skill level, he'll get down and lay with her or rattle toys for her, so I already am seeing a glimpse! ^^ She found her feet (or shoes) and loves them. She lifts them up in a pike and stares back and forth at each foot! 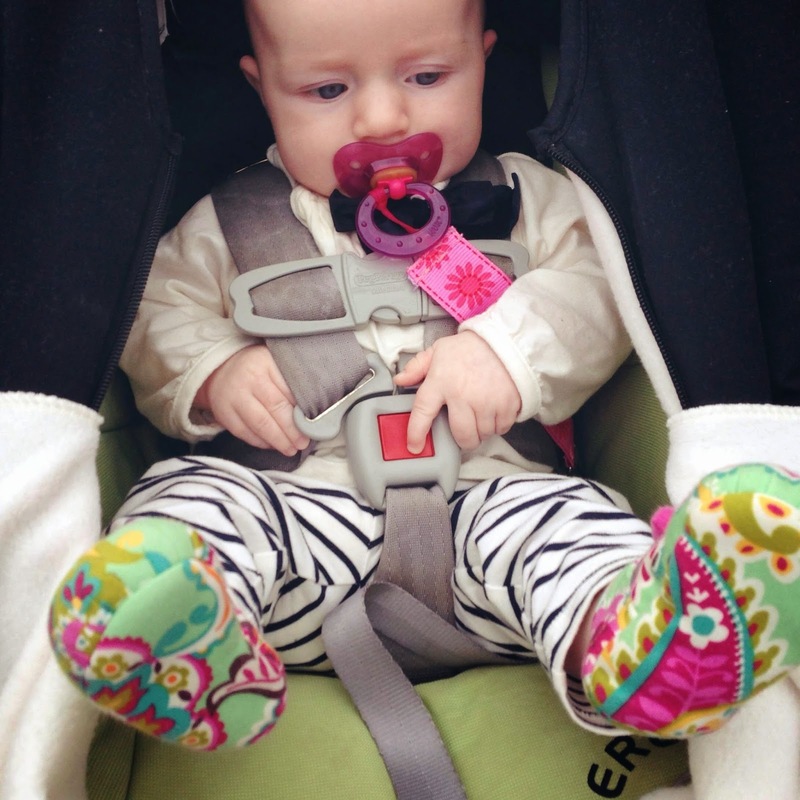 Loves: While she still isn't a big fan of her carseat (though, getting better! 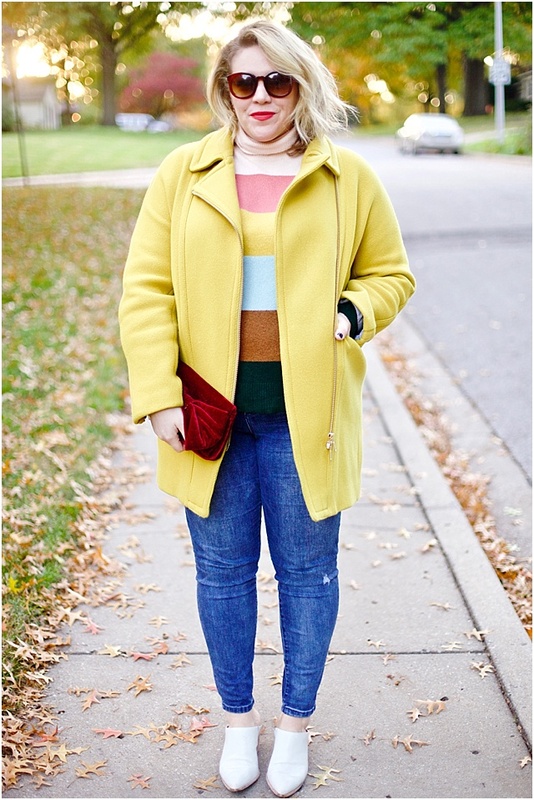 ), she seems to enjoy walks and looking all around! 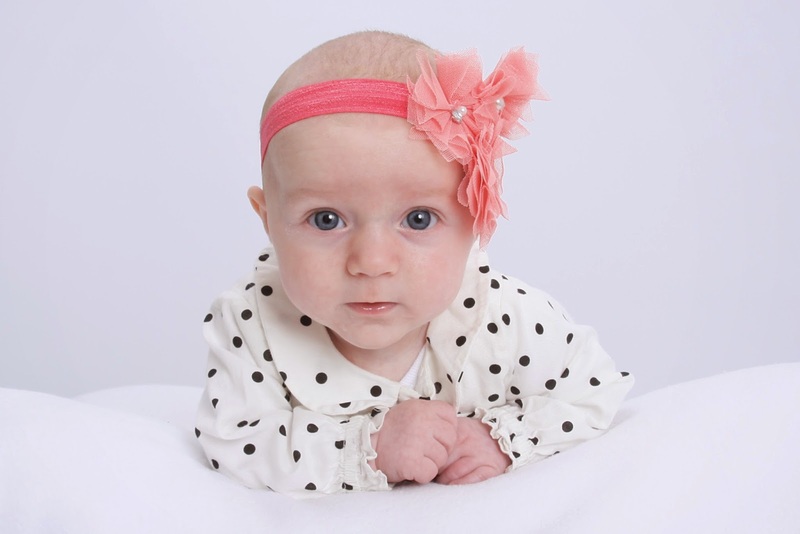 Her eyes get big and curious - I predict she'll love spring & summer (hah, who doesn't?!). When she's tired, she loves to be held sideways and nuzzle her head into my arm. If she's really tired and having a hard time getting to sleep, she loves light taps to her tush (weird!)... She still loves baths and I love her little tush! She loves to be talked to in silly voices... she smiles all the time at me (which makes me so happy)! 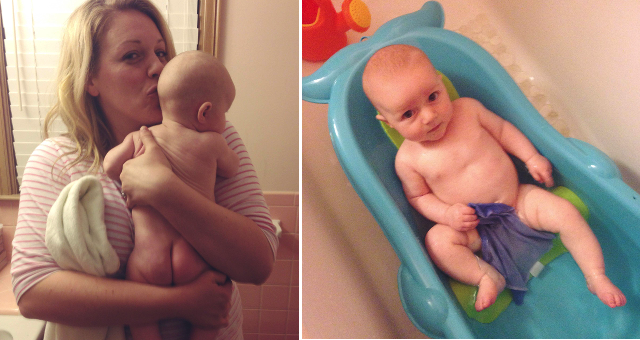 Eating: We're still nursing and I'm still pumping (which, hello, it's a part time job at least!) when I'm at work for her to have bottles during the work week. It's hard to fit it all in when I'm at work, but I'm proud at how far we've gotten since Liam and I had a hard time making it work and I kind of dried up at 3 months. She is kind of a fussy eater, which makes nursing in public or around people really hard. She doesn't just latch on and stay, she pulls of, roots back, moves her arms and hands all around, etc. So we plan outings in between feedings or I pump to bring a bottle on the weekends, if we go anywhere (hah). 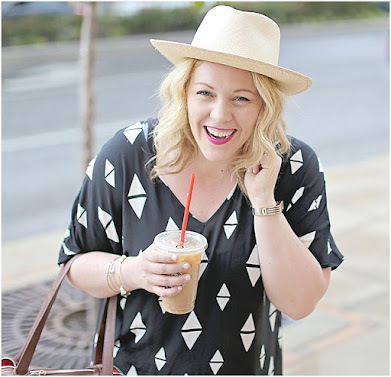 This last month has been huge as far as an eating schedule - I think daycare helped with that big time! They have to have those babies on schedules so they don't all want to eat at the exact same moment... But she's really good about eating every 3 hours now, and sometimes during weekend days, I'll try to get her to eat closer to ever 2.5 hours if I can just so she'll have stocked up for night. 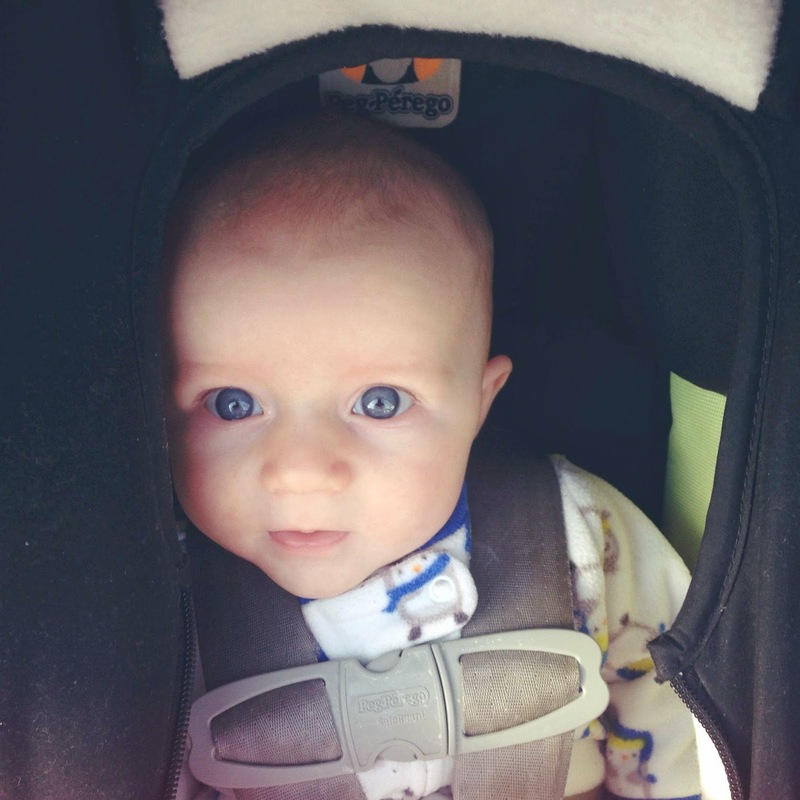 Pacifier clips; the Baby Merlin's Magic Sleepsuit - as mentioned above, lifesaver; Cool-Mist Humidifier - because month long colds, and it's cute; Double Stroller - now that the weather is turning nice, we like to get out and walk. We love this one b/c of how versatile it is; Sound machine - we love the Sleep Sheep still, but this ones stays on all night and is great for hiding noises that may come from our toddler; Bumbo - (the mint one is so cute!) Liam didn't use the Bumbo a ton, but Nora is already very in to it. She loves to sit up! ; Moccasins - we have loved these shoes for Liam, so easy to put on, durable and recommended for learning to walk/strengthening feet. Not that Nora really needs shoes right now, these are too cute + stay on better than socks (actually stay on). We have moccs from Freshly Picked, Willow and Fig and TaytsShop (shown)! 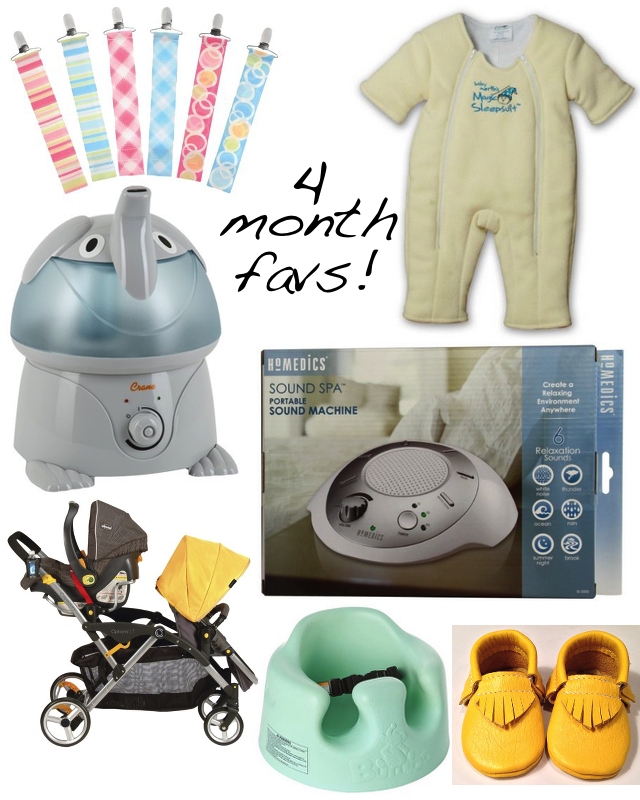 What are some of your favorite things for a 4 (or so) month old?